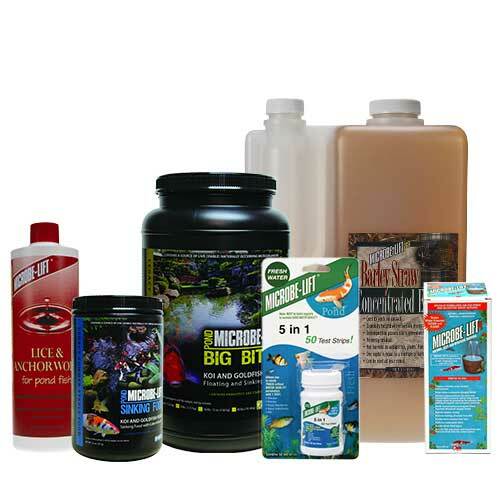 Microbe Lift PL, Beneficial Bacteria, Algae Control, Pond Autumn Prep Eliminate green water and create a healthier, balanced eco-system for your koi and goldfish with Microbe-Lift products. Get tough on algae with Ecological Laboratories' Mean Green Algae Team two-step program, comprised of our MICROBE-LIFT/PBL"the #1 selling bacterial pond additive on the market"with GreenClean®, an EPA Registered granular algaecide! GreenClean is great for killing the algae. Apply it and watch most filamentous or string algae die before your eyes! Three days after its usage, apply MICROBE-LIFT/PBL to make the dead algae completely disappear by degrading it to carbon dioxide and water! In addition, MICROBE-LIFT/PBL will seed your filter; help break down other organic sediments on the bottom of your pond; keep the water crystal clear; and help establish and maintain efficient nitrification. GreenClean can cause an increase in salinity or rise in pH, so be sure to test your pond water especially if you have ammonia levels above 0.8 mg.
Microbe-Lift/Eliminate is a special formulation that first binds the odor molecules, and then with the specially selected bacteria contained in this product degrades them. The odor causing molecules are converted into carbon dioxide and water! This unique, biologically formulated product employs the latest natural technologies. It is highly concentrated blend of friendly, beneficial bacteria. This natural formula will not just cover strong pet odors; it will eliminate them at their source! Note: Do not use Microbe-Lift/Eliminate in combination with chemicals, bleach or detergents. These agents will kill the beneficial bacteria.